The Heritage Foundation has updated its Saving the American Dream plan as the nation moves inexorably towards the fiscal cliff set to hit at the beginning of 2013. To meet this challenge, Heritage Foundation experts updated our Saving the American Dream plan to address the fiscal cliff and then rein in spending. Our plan features a sweeping pro-growth tax reform plan to grow the economy and generate more revenues and a broad restructuring of entitlement programs to provide real economic security to seniors while making the programs affordable. The plan balances the federal budget within 10 years—without raising taxes—and stabilizes and then reduces the debt. The Heritage plan focuses government assistance to those who truly need it, with a guarantee that no American would have to live in poverty. It would also begin to reduce government back to its constitutionally authorized powers and make defense funding a core priority. 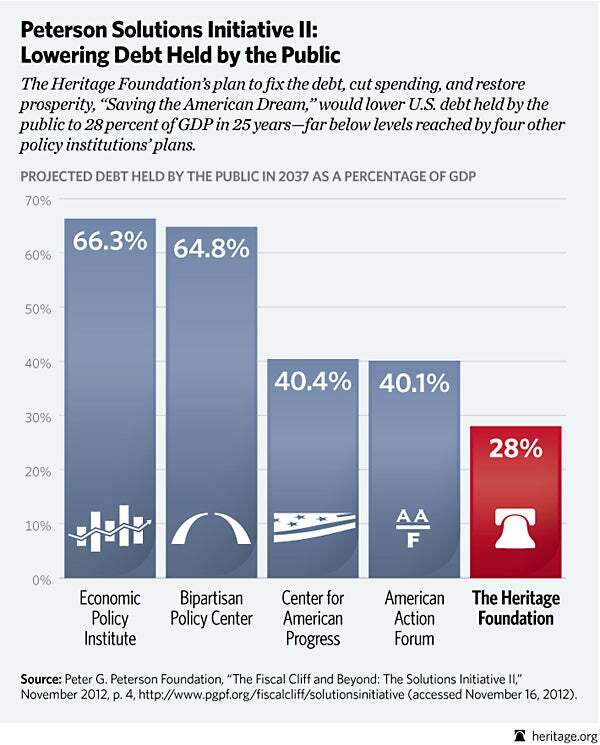 Payne illustrates how Heritage’s plan would reduce the debt held by the public–currently at 73 percent of GDP–to 28 percent by 2037, the lowest plan among five submitted as part of the Peter G. Peterson Foundation’s Solutions Initiative II.